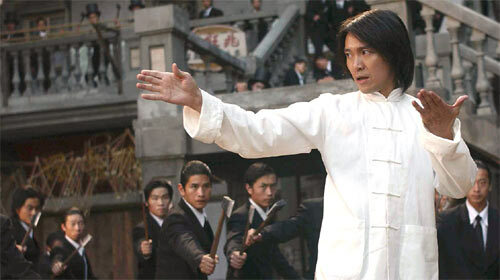 Stephen Chow hustles some foes in Kung Fu Hustle. The Skinny: Stephen Chow's long-awaited film is an under-developed kung-fu comedy that owns all thanks to its astoundingly keen commercial filmmaking sense. While repeated viewing may lessen its impact, Kung Fu Hustle is the wild and undeniably entertaining crowd-pleaser that Hong Kong Cinema fans have been waiting for. It's great, but also kind of sad. 2004 has been a veritable box-office wasteland for Hong Kong Cinema, with the highest grossing film being Fantasia at approximately $25 million dollars. Then it takes all of one week for Stephen Chow's Kung Fu Hustle to eclipse the grosses of every other HK film AND resurrect interest in the local film market. How can one man succeed where Jackie Chan, Andy Lau, Sammi Cheng and Johnnie To fail? What's the secret to Chow's ability to break the bank? Special effects? Slapstick comedy? The ability to make an entertaining movie? No Wong Jing? The likely answer: all of the above. Kung Fu Hustle may not be best Hong Kong film of the year, but its commercial instincts and eclectic mixture of elements makes it an absolute winner. For sheer entertainment value, nothing else in 2004 comes close. Stephen Chow is Sing, a downtrodden dope in 1930s Shanghai who aspires to be a member of the Axe Gang, the top triad in the region. Led by Brother Sum (Chan Kwok-Kwan of Shaolin Soccer), the Axe Gang rules all thanks to their stylish attire, keen axe-throwing skills, and above all their toe-tapping rhythm. Besides ruling the streets of Shanghai with an iron fist (or axe), the gang breaks out into spontaneous dance numbers, and even Brother Sum likes to boogie after blowing someone away with a shotgun. Sing can't really expect to become a member of the Axe Gang because he's useless and a poor bluffer. He and his tubby sidekick (Lam Chi-Chung of Shaolin Soccer) pretend to be Axe Gang members to shakedown the local slum Pigsty Alley, but their antics cause more personal pain than profit. Even the lowest resident of Pigsty Alley seems equipped to deal with the pathetic pair. But can the residents of Pigsty Alley stand up to the real Axe Gang? The easy answer: yes, they can. Sing's shenanigans cause the real Axe Gang to show up, but before the gang can get their groove on, they're shown up by three hidden martial arts masters who make their presence known in grand exaggerated kung-fu style. Thanks to nifty special effects and fun fight choreography, these martial arts masters can take on scores of foes with all the hard-hitting, slow-mo, bullet-time panache that Stephen Chow and his fight choreographers (Yuen Woo-Ping and, briefly, Sammo Hung) can muster. The Axe Gang can only counter with their own martial arts masters, plucked from the countryside or maybe even the local mental hospital, which leads to even more CG-enhanced fight sequences. The back-and-forth between the Pigsty residents and the increasingly pissed-off Axe Gang forms the major conflict of Kung Fu Hustle, but there still remains one major player: Sing, who begins to show shame at his chosen criminal life. Will Sing change his tune? And if he does, can a dopey wannabe thief even hold his own against scores of axe-wielding bad guys AND the Beast (Leung Siu-Lung), who may be the strongest martial artist ever? Again, there's an easy answer: yes, he can. This is a Stephen Chow movie, so Stephen Chow is endowed with the ability to get himself out of every narrative jam possible. As director, producer, writer and supposed star of Kung Fu Hustle, Stephen Chow brings the full complement of his cinematic obsessions to the table in predictable, and yet enthralling style. Long a fan of Bruce Lee, Chow apes his hero in a number of small homages. Martial arts fictionfrom movies to comics to novelsgets referenced nonstop, to predictable audience-pleasing effect. Chow clearly enjoys the new creativity given to him by special effects, and uses them to enhance the film's martial arts in expected and hilariously exaggerated ways. The source material is varied; the energetic and blatantly fantastic way foes are sent flying recalls Chinese comics and Japanese anime more than older martial arts films, and Chow manages a few comic sequences that are more out of Road Runner than Wong Jing. None of this would be possible without computer graphics, but unlike The Storm Riders or The Legend of Zu, the CG isn't mainly for show. Like in Shaolin Soccer, Chow uses CG imaginatively, enhancing the physicality and energy of his action sequences in spectacular ways. Tsui Hark, take some notes. On the other end, Chow gives us his usual comic shenanigans, with predictably hilarious but somewhat labored results. The comedy in Kung Fu Hustle seems obligatory when compared to the action, which is a strange thing to say about a Stephen Chow movie. It's still funny stuff, and Chow assembles a fine ensemble of minor names and no-names as his menagerie of caricatures and cutups. Yuen Qiu and Yuen Wah are hilarious as Pigsty Alley's landlords, and semi-regular Chow cohorts Lam Chi-Chung, Tin Kai-Man, and Lam Suet provide decent support. Still, the comedy and even the action are less interesting than the winning way in which Chow reveals his characters' nobility and martial arts mastery. Chow makes winners out of losers, and rediscovers heroism in unexpected, and seemingly unlikely ways. It's not original stuff; the cliché of the hidden martial arts master can be seen in everything from early Shaw Brothers flicks all the way up to The Karate Kid or even the Star Wars films. It's narrative shorthand that elicits an immediate response, but Chow uses it exceptionally well. If it weren't given such style and audience-pleasing panache, one might even be annoyed at how obvious and even flimsy it all is. There's even more flimsy stuff. Sing's love interest is his first love Fong (Huang Sheng-Yi), a dumb mute ice cream seller whose two brief appearances manage to shock Sing from wannabe bad boy back to noble do-gooder. Sing himself isn't very well developed, partially because he's given truncated, and even isolated screen time. Chow is more of an ensemble player than the film's star, which is why his eventual promotion to the starring role feels a bit odd. If anything, the stars of Kung Fu Hustle are the residents of Pigsty Alley, and not the wannabe gangster caught in the middle of their conflict with the Axe Gang. When Chow eventually moves front-and-center, it almost feels like it shouldn't be happening. And while we're talking negatives, the characters are underdeveloped, the conflicts uninspired, the climax convenient, and the love story simplistic to the point of maudlin lameness. Shaolin Soccer easily carried more emotional weight than anything in Kung Fu Hustle. Notes:  Coming to North America this April, courtesy of Sony Pictures Classics. You can visit the official site here.